Multiple outputs, extended sweep, ergonomic design and lightweight, all-aluminum construction: This is the next generation Mission expression pedal. 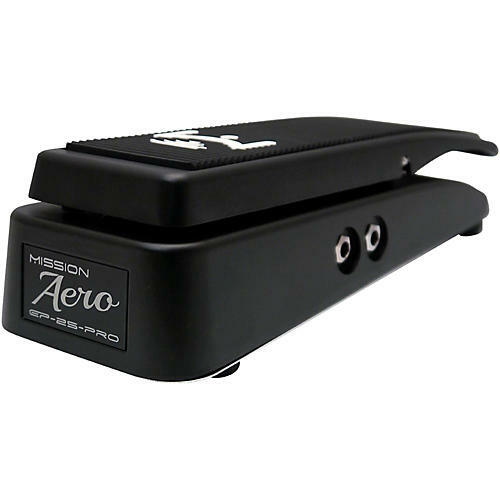 The EP-25-PRO is the first expression pedal to feature the new Mission Aero design. At just 1.7 lb., the all aluminum Aero is half the weight of a standard Mission pedal, ideal for fly rigs and other weight sensitive applications. The 25K Ohm linear taper potentiometer in the EP-25-PRO is fully sealed for a smooth action and a long life. Dual channel outputs control one or two devices simultaneously, and can be expanded with Expressionator to control up to four devices from one expression pedal. The extended sweep of the Aero design makes this an ideal all round expression pedal for volume control as well as wah, whammy and effects parameter controls. The rear cut away and extended length curved surface are ergonomically designed for comfortable use in either standing or sitting positions. The EP-25-PRO is perfect not just for for guitar, but keyboards, acoustic instruments, and both live and studio use.